May is a good time to be in New York City. People are happy to be out and about. It’s nice sleeping weather (our house doesn’t have A/C, so this is a big thing for me!). And there’s finally more at the greenmarket than tired ol’ potatoes and apples. About the same time I saw the first rhubarb here, my copy of Nigel Slater’s Tender, Volume 2 (called Ripe: A Cook in the Orchard in the US edition). I knew he’d have some good rhubarby ideas for me…this guy has a London city garden that puts my weedy Brooklyn backyard to utter shame. I’ll certainly never have a mini orchard like he does, but maybe one day I’ll have a couple of raised beds for a few homegrown herbs and things. Until then, I’ll have to tote my seasonal fruit and veg home from the market. Slater’s Rhubarb Cinnamon Polenta Cake would be just as good for breakfast as it is for dessert. It’s made from more of a dough than a batter. The cake is a little crunchy from the cornmeal and perfectly moist, but sturdy enough to support the layer of baked rhubarb that makes a pink stripe in the center. I make a stove-top rhubarb compote a lot when it’s in season, but I kind of like the more hands-off baked method from this recipe, and I’d use it again even if it’s just for my morning granola. The rhubarb more or less keeps its shape when handled this way and you get to pour off the gorgeously pink liquid it releases. Even if I wasn’t going to serve it alongside the polenta cake, I wouldn’t think of pouring this down the drain. Hello, homemade rhubarb sodas, cocktails, yogurt or ice cream drizzle…I could go on. Note: Use a medium to coarse cornmeal/polenta for the best texture. The cake is fragile when warm, so it’s best to serve it cool, together with the reserved juices from the cooked rhubarb. -Lightly butter am 8-inch (20-centimeter) loose-bottomed cake tin, preferably spring-form. Set the oven at 350°F (180°C/gas mark 4). Put in a baking sheet to get hot. -While your oven is heating, trim the rhubarb, cut each stem into three or four pieces and put them in a baking dish. Scatter over the sugar, toss, and let everything sit until the oven is hot. Sprinkle over the water and bake for about 30 minutes until the rhubarb is soft but still retains its shape. Remove the fruit from the dish and put them in a colander to drain. Reserve the juice to serve with the cake. -Put the cornmeal/polenta, flour, baking powder, cinnamon and caster sugar in the bowl of a food processor. Add the grated zest and the butter, cut into smallish pieces, then blitz for a few seconds till you have something that resembles breadcrumbs. (You could also do this by hand, rubbing the butter into the polenta with your fingertips as if making pastry.) Break the egg into a small bowl and mix with the milk, then blend into the crumble mix, either with the food processor or by hand. Take care not to over-mix: stop as soon as the ingredients and liquid have come together to form a soft, slightly stickydough. If it isn’t sticky, add a little more liquid. -Press about two-thirds of the mixture into the cake tin, pushing it a couple of centimetres up the sides with a floured spoon. Place the drained rhubarb on top, leaving a small rim around the edge uncovered. Crumble lumps of the remaining polenta mixture over the fruit with your fingertips, and don’t worry if the rhubarb isn’t all covered. Scatter over the demerara sugar. Bake on the hot baking sheet for 45-50 minutes, then cool a little before attempting to remove from the tin. Serve in slices with the reserved rhubarb juice. You can wrap leftovers in plastic and refrigerate for a couple of days…just bring back to room temperature before serving. Yum! Like the idea of this for breakfast ..
I’ve never baked with rhubarb and have been wanting to. This looks like a great recipe to try. this looks like exactly what I want to eat this weekend. Since I don’t have a scale, any suggestion on converting the measurements to cups and tablespoons? Hi. You can prob do a quick search for the ingredient conversions, but I think that for the rhubarb you could go with a pound of it plus a couple tablespoons of sugar. Then for the cake, about 3/4 cup both cornmeal and sugar, 1 1/2 c flour and 10 tbsp butter. It’s nice to find a dessert recipe for rhubarb that’s different from the standard rhubarb strawberry pie (not that I don’t love that). I’ll be trying this one. This is a beautiful cake! I love the flavor combination here, great job! 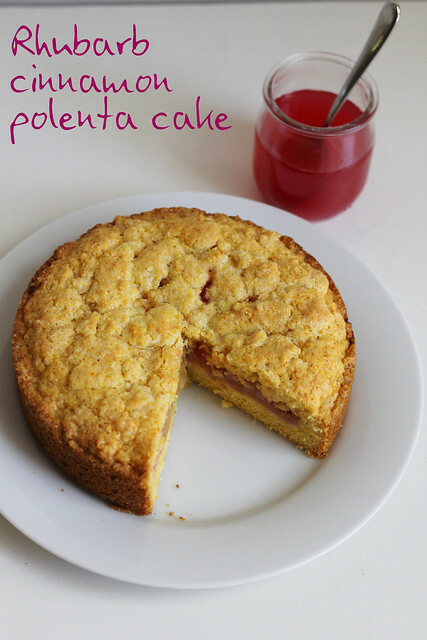 I hope I can find some rhubarb to make this! Stephanie, I love the pictures of your cake and I love Nigel Slater`s books as well! Now that rhubarb is quite abundant I will have to try this wonderful recipe – thanks for posting it! Hello! 🙂 This looked real good so I thought I’d give it a try. The cake turned out good and it tasted good but the cornmeal stayed grainy. I used a coarse grind and I found the texture unpleasant, is it suppose to stay grainy?! Just wondering. Yes, I think you are supposed to get the grainy crunch from the cornmeal here. The author specified coarse ground so the texture is most noticeable, but I used medium ground, because that’s all I had. thanks for your reply 🙂 I’d say, stick to the medium ground, my polenta was too coarse lol.